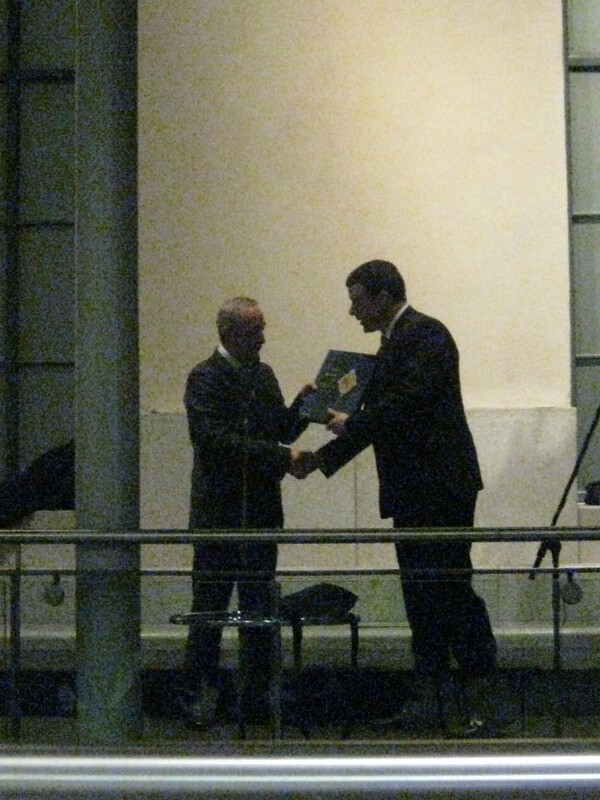 Last night I attended a ceremony at the Houses of the Oireachtas at which the London Irish Centre in Camden was presented with a donation of more than 6,000 books, CDs and DVDs, which will form a new library for use by anyone interested in Irish literature, language and culture. The project to donate books from Ireland was organised by the Oireachtas Joint Committee on Environment, Culture and the Gaeltacht, and particularly its chairman Mr Michael Mc Carthy TD, with a huge amount of the practical organisation and energy being provided by the clerk to the committee, Mr Eugene Ó Cruadhlaoich. The transport of the books to London is being sponsored by An Post, and even the shelving required to house the collection has been donated by Irish libraries. At NUI Maynooth, we were delighted to be able to donate books to this tremendous initiative: the Department of Early Irish donated copies of all of the Maynooth Medieval Irish Texts series and the Maynooth Studies in Celtic Linguistics series, in addition to books such as Progress in Medieval Irish Studies, ed. Kim McCone and Katharine Simms (1996) and the seminal textbook on the history of the Irish language, Stair na Gaeilge (1994). NUIM also donated books in, and on, Modern Irish, including copies of the journal Bliainiris. Furthermore, the School of Celtic Studies at the Dublin Institute for Advanced Studies made a massive donation of more than 300 books, representing every DIAS publication, including multiple copies of key reference works such as Thurneysen’s Grammar of Old Irish and Kelly’s Guide to Early Irish Law. Collectively, these donations make the new library at the London Irish Centre one of the most comprehensive collections of Celtic Studies books in England: this will be a very significant resource for any scholars of Celtic based in London. At last night’s ceremony, which was attended by representatives of the publishing houses, universities, cultural groups and research institutes that have made donations to the library, there were readings by authors and poets, including Nuala Ní Dhómhnaill. Then David Barlow, Chief Executive of the London Irish Centre, spoke movingly about the work done by the Centre to support the London Irish community, including very vulnerable members of the community both young and old, and about the cultural value of the new library and its potential to reach out to a community which comprises not just people of Irish origin, but anyone – from any background – who has an interest in Irish literature, language and culture. The choir of the Oireachtas then performed a series of songs, including a moving rendition of ‘Streets of London’, reinforcing the overwhelmingly important work done by community centres such as the London Irish Centre in Camden. Yesterday, a diverse group of writers and scholars gathered in Maynooth for an afternoon workshop on ‘Modern Writers and Medieval Literature’. 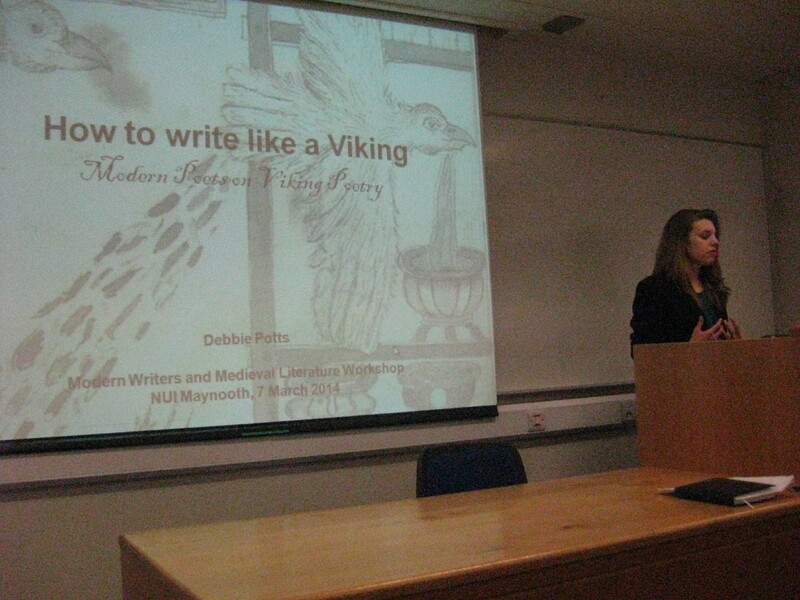 We enjoyed a series of wonderfully thought-provoking presentations from four speakers: first, Dr Debbie Potts of the ‘Modern Poets on Viking Poetry’ project introduced us to the concept of kennings – literary circumlocutions found in Old Norse and Anglo-Saxon poetry, such as ‘horse of the sea’ (i.e. a ship) or ‘battle moon’ (i.e. a shield) – and to the corpus of skaldic poetry. She then shared examples of some of the poems which have been composed by contemporary poets in response to selections of Old Norse poetry. We were particularly moved by the powerful filmpoem Sonatorrek (Loss of Sons) by Alastair Cook and John Glenday, inspired by the tenth-century poet Egill Skallagrímsson. 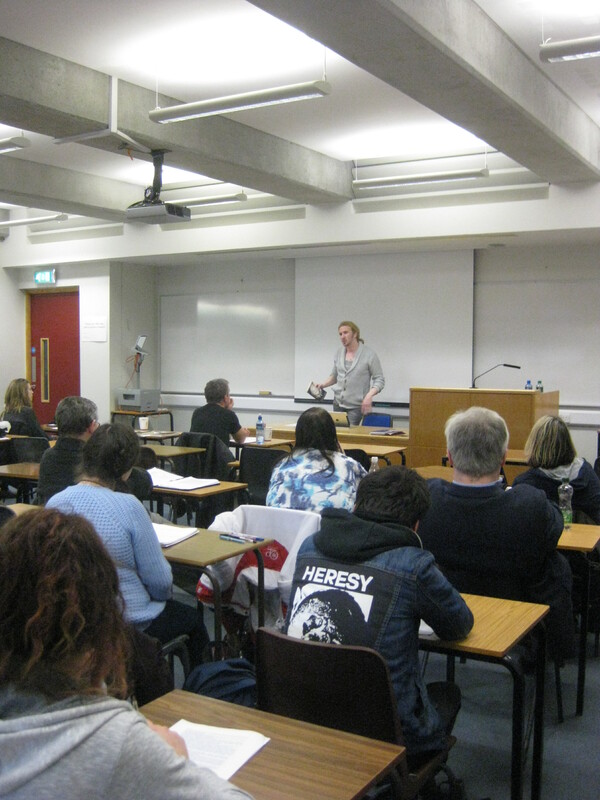 Debbie’s paper raised interesting questions, subsequently developed by other speakers, about the creative ways in which modern authors can engage with – and be inspired by – medieval literature without archaising or sliding into nostalgic sentimentality. The poems which Debbie shared with us were fresh and bold compositions in which the medieval forms and tropes were a springboard for the creation of something entirely new. Our second speaker, the Welsh novelist and poet Chris Meredith, began by evoking the idea of being in an aeroplane, looking down at the clouds beneath you, and in the occasional break between the clouds getting a fleeting glimpse of the earth below – a fragment of a river here, a fragment of a forest there. Chris suggested that reading medieval chronicles is a very similar experience – we get snatches of a fragmentary landscape, but we cannot see the whole. He argued that the novelist has the freedom to imagine the landscape in its entirety, and in this way his novel Griffri offers a fully-conceived picture of twelfth-century Wales fashioned from terse annal-entries in the medieval Welsh chronicle Brut y Tywysogion. Chris also spoke of the illumination he had found in medieval Welsh poetry, and read a stunning list-poem, influenced by a late medieval Welsh elegy for a poet’s infant son, which Chris had written for his then-unborn child. Next, Pádraig Ó Cíobháin spoke passionately about his engagement with Irish literary tradition as a writer who gives a twenty-first century voice to medieval Irish sagas. With epic range, Pádraig brought Ovid, Italo Calvino, and Umberto Eco into dialogue with the Saga of Fergus mac Léti, catching ideas with intricate nets of wordplay and allusion. Pádraig offered the perspective of a native speaker of Irish, who writes as Gaeilge on medieval Irish literary themes, and his was a perspective that was dynamic and outward-looking, throwing off misconceptions about the constraints of writing in Irish, and articulating truths in ways both direct and indirect. Where Pádraig dives headlong into the world of medieval Irish saga, our final speaker, Trevor Byrne, has engaged with medieval Irish heroic literature in more tangential and oblique ways. He spoke to us about his novel, Ghosts and Lightning, in which the central theme of grief, and dealing with loss, is expressed through a narrative strand involving Cú Chulainn: Trevor read the moving conclusion of his novel, when the main character, Denny, goes in search of the stone pillar to which Cú Chulainn in his death-tale is said to have lashed himself, thereby evoking ideas of memory and loss, death and memorialisation. In the second half of his paper he read from his novella set in Dublin during the Black Death, and spoke of the inspiration he had drawn from Boccaccio’s Decameron and from the chronicle written by Friar John Glyn in Ireland as a witness to the devastating pandemic. In the face of such rich fare, the discussion was inevitably wide-ranging, but particular themes which the speakers and audience explored during the discussion were the relationship between academic research and creative writing, the need – or lack of need – for historical accuracy (it was generally agreed that ‘truth’ and ‘accuracy’ are not synonymous, the latter being infinitely less important than the former in works of fiction), and the use of modern idiom, dialect, and a contemporary register in works of historical fiction. The afternoon was extraordinarily stimulating, and vibrant debate continued over a wine reception and dinner. I would like to thank the School of Celtic Studies at NUI Maynooth for their generous financial support of this event. I am enormously grateful to An tOllamh Ruairí Ó hUiginn, Professor David Stifter, and Mairéad Uí Fhlatharta for practical help and their enthusiasm for this endeavour. And I would like to thank Debbie, Chris, Pádraig and Trevor for responding so magnificently to the invitation to address the theme, and for providing us all with so much satisfying food for thought.